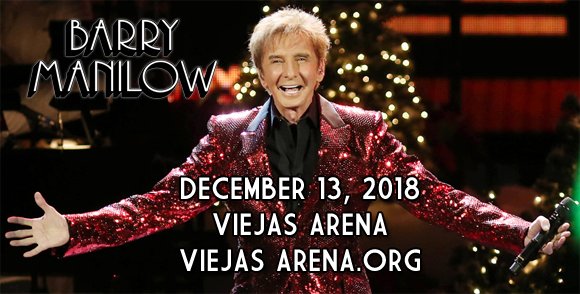 It's the most wonderful time of the year, as one of the finest showmen of all time, Barry Manilow comes to Viejas Arena on Thursday 13th December 2018 for A Very Barry Christmas! Singing a host of holiday classics, the celebrated performer will be bringing his unique charm and charisma to the winter tunes everybody knows and loves! 'Tis the season to be jolly… 'Tis the season to be Barry! With over 80 million albums sold worldwide, American singer-songwriter, arranger, musician, and producer Barry Manilow is one of the world's best-selling artists. Manilow began his career as a composer and jingle-writer in the 1960s, and later as a musical director, conducting and arranging for Ed Sullivan's production company, where he was asked to arrange a new theme for The Late Show.By 1969, Manilow was signed to Columbia/CBS Music by vice-president and recording artist Tony Orlando. In the 1970s, he also became a producer, and he went on to produce Grammy Award-nominated albums for Bette Midler, Dionne Warwick, Nancy Wilson and Sarah Vaughn. Manilow's self-tiled debut album was released in 1973, but it was his 1975 breakthrough number-one hit, "Mandy" that brought him to public attention, as the first in a string of smash hit singles. Throughout his career, Manilow has released 47 Top 40 singles, including 12 number one and 27 top ten hits, as well as multiple multi-platinum-selling albums. Manilow has been awarded many times throughout his career – he has a Grammy Award, a Tony award and two Emmy Awards, a star on the Hollywood Walk of Fame, and he has been inducted into the Songwriter's Hall of Fame, among many other accolades.